Considering its location - one block from Main Street - I don't know of a house in the City that's in worse shape. Last month I posted about this house - 70 Riley Off to a Landfill - and spoke with City officials who told me that the place was coming down in the next few days. Well 6 weeks after the collapse of the exterior wall you can see nothing has changed. I took this photo yesterday. Today I'm asking you for help. Please take a moment and call the Mayor's Call and Resolution Center at 716-851-4890 or complete the form available from that link. Or if you prefer, contact Councilman Brian Davis who represents the Ellicott District where 70 Riley Street is located. He can be reached at 716-851-4980. In either case please let them know that 70 Riley Street is clearly beyond repair and should be demolished immeadiately. Kindly let me know if you've called by leaving a comment here. I'd like to think that together we can make a difference. Let's see if City Hall is listening and how much longer and how many phone calls this will take before we get action. Please consider emailing this post to your friends and family members asking them to call, too. This magnificant and formally city owned house at 97 Dodge Street has a new owner. It had been on the City's demolition list for several years and now has a new lease on life. A local woman was successful in wrestling the deed from the City's hands last week and will soon make this house - a block from Artspace - her family's home. fixBuffalo readers may remember a series of posts from January 2007 - Biting My Tongue and Total Wow!! - Inside 97 Dodge. While a number of houses in the Artspace Backyard Neighborhood have been saved from the landfill recently there are a number of amazing places still searching for love - 94 Northampton is just one of these. If you're interested in taking a closer look and serious about making this place your home, let me know. I've recently added an index to this blog - buildings & issues index - right next to 'home' and 'intro & contact' located in the above banner photo. In the next few days, I'll be adding additional content to this index. I hope this will assist my readers navigating around almost four years of posts. I grabbed this shot late last month along Ellicott Street and while leaving Ulrich's earlier today after lunch, a couple of friends from Germany asked me about the bridge. I realized that nothing has happened at this site for at least 15 months. 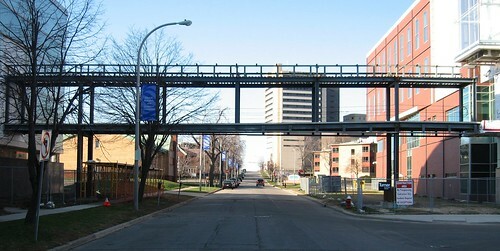 The bridge is supposed to connect the UB Bioinformatics (yikes...check out the video) building and Hauptman Woodward. The bridge looked like this last March and in June 2007 - Bridge to Nowhere and ditto a few months later in October 2007. So...anybody know what's planned and what the time table is for this project? Ben from SeeClickFix shot me an email this afternoon and asked me to check out his google map mash-up and sort of test drive the new application. Immediately I found this so easy to use and it has a level of possibility for community organizing that I'm just beginning to get my hands around. 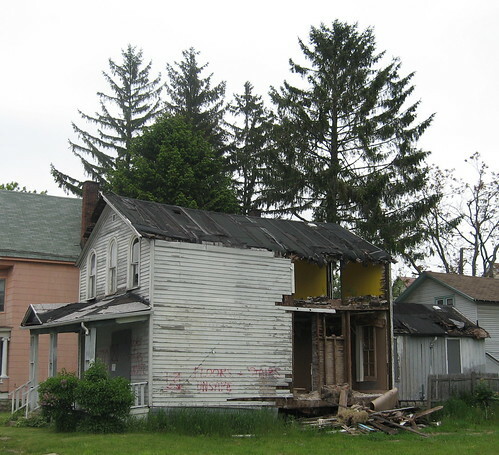 So, I'm opening this post to fixBuffalo readers who may feel passionatly about a particular house or building in Buffalo and might want to share their interest(s) with others. Though my focus is on Buffalo's East Side - I'm very aware that most of my readers live in neighborhoods on the the other side of Main Street - I'm curious to know where this might lead when you start placing additional points on the map. So...drill down into the map, click on a location and fill in a couple fields. This could become very interesting. that might give you an idea as to the project's scope. update May 13th - two additional neighborhood pics! I noticed 'asbestos' signs were posted recently, one of the final steps in demo preparations, here at 1572 Jefferson Avenue. It's a house that the City has owned since last October and was originally marked for demo last August. I first posted about it - here - in August 2006. 1572 appears solid, has plenty wrong with it yet would make an amazing project. It's located just a few blocks away from the new Merriweather Library and Canisius College. Here's the map. As long as the building is standing there's time to act. If you're interested in taking a closer look at this property, please let me know. In a week or so I imagine it'll be in some landfill. 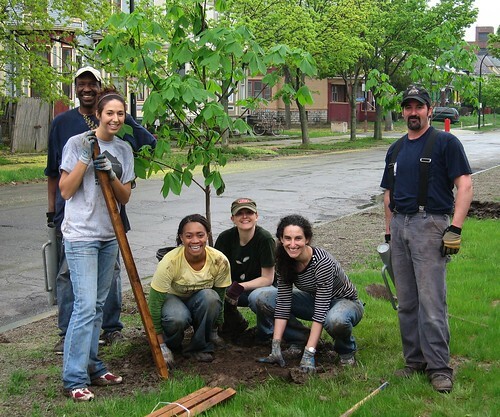 Volunteers from two of Buffalo's most amazing new organizations - Queen City Farm and Buffalo ReUse - gathered last Saturday to plant trees in the city's Cold Springs neighborhood. Here, one of the teams is planting a chestnut tree on Woodlawn Avenue alongside the new home of the Arts Academy. The trees were supplied by Re-TreeWNY. According to Rod McCallum, project coordinator from Queen City Farm, neighbors joined in and a total of 150 trees were planted. Both of these organizations are helping to transform this neighborhood in ways that might have been unimaginable just a year ago. If you haven't checked out the ReUse store for your renovation and building needs you really should. And for the foreseeable future, every Saturday is a community work day at Queen City farm. Come on over and get involved! This week on Smart City, the wave of foreclosures hitting many American cities are challenging many communities to wonder, "What's next?" 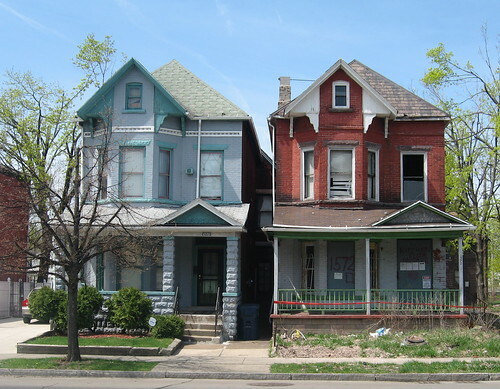 Can these neighborhoods be revived? And if so, what will it take? Those are questions we'll ask Alan Mallach whose new report on Managing Neighborhood Change comes just at the time when many communities are needing that help. Earlier this week I received an email from the new owners of the Woodlawn Row Houses. 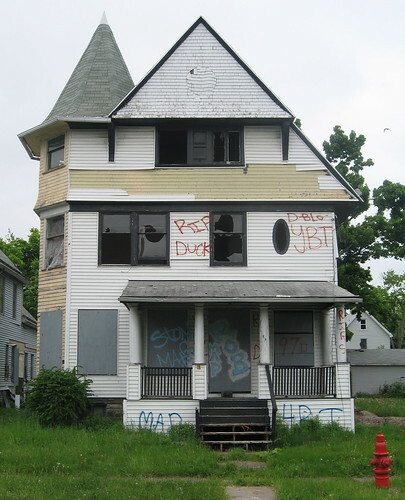 fixBuffalo readers may remember that the City of Buffalo sold this 'local landmark' for $8500.00 to the Urban Development Partners, LLC last September. Buffalo's Common Council has approved their plans and with financing in place one of the partners told me that they expect to start work sometime later this month. 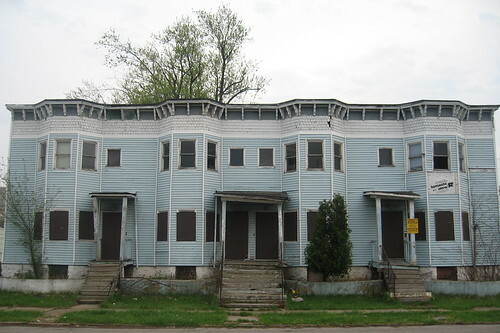 I've been following the story of the Woodlawn Row Houses for the last four years - see, archive. They've remained a focal point of this blog since the beginning for a variety of reasons. Back in the day when neighborhoods were as tight as Brooklyn, there used to be 21 sets (see map) of row houses here in Cold Springs. Today, only three sets of these architecturally unique dwellings remain. I'll be following the project closely and hope to have an interview with the new owners very soon. 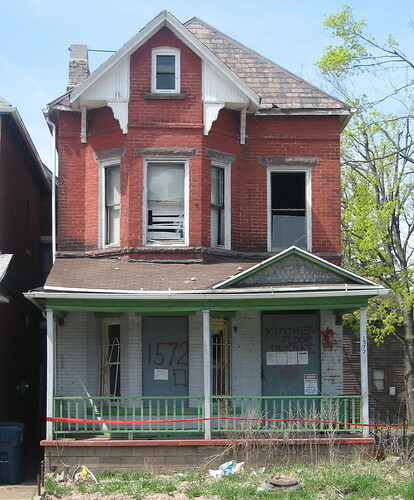 The Woodlawn Row Houses were one of 104 other properties that were on the block last September during a special auction. Ineresting that only 31 of these city owned properties will be transferred to new owners. Here's that updated list.